International Journal of Research in Health Sciences,2015,3,2,326-331. 1-Senior Resident, 2-lecturer, 3,4-Post Graduate student, Department of Ophthalmology, UPRIMS & RESEARCH, Saifai, Etawah, Uttar Pradesh, INDIA. 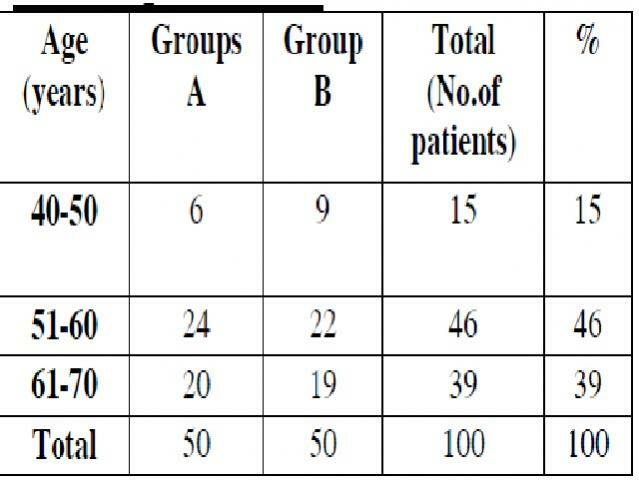 This is a prospective comparative interventional study performed in the patients attending in opd of ophthalmology,uprims &r,saifai over the periodof 1 year.the detailed history, general and ophthalmic examination done on 100 selected patients with different stages of cataract. Then they underwent SICS with PCIOL surgery. These patients divided into two groups the Group ‘A’ and Group ‘B’, 50 patients each. Group. A patients received round edge single piece PMMA IOL and Group B received square edge IOL. The subsequent follow up was done at first post op day, one week, one month, 3 months and 6 months. Some were followed more frequently whenever needed. At each visit record the BCVA,slit lamp examination for PCO grading , fundus examination and Nd:YAG capsulotomy done if needed. The best corrected visual acuity achieved post operatively (at 1 month) doesn’t vary significantly between the two groups. 80% patients in Group A and 84% in Group B achieved BCVA of 6/9 or better. Thus, post operative vision attained is not affected by the optic edge design of the intraocular lens but at the end of one year after surgery, significant visual acuity loss was present in 16% cases of Group A and 8% cases of Group B and Clinically detectable PCO was present in 20% cases of round edged PMMA IOL group and 8% cases of square edged IOL group.Overall PCO rate was 14% while significant visual loss was seen in 12% cases. The Nd: YAG Laser capsulotomy rate doesn’t correspond to the PCO rate. This implies that all cases with clinically detectable PCO may not require Nd: YAG capsulotomy.Both the rate of posterior capsule opacification and rate of Nd: YAG posterior capsulotomy is significantly lower in cases of square edged PMMA IOL as compared to that in round edged PMMA IOL.